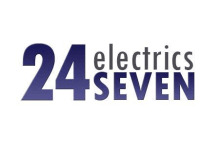 Using state of the art equipment & fully qualified, experienced, friendly staff, 24SEVEN electrics provides a professional range of electrical services both domestic & commercial. A skilled and reliable electrician. Every job is done to perfection and competitively priced. I would highly recommend, very professional. Always professional and impeccable work. I would have no problem recommending him. Were with us within 3 hours. Reliable, friendly and always turns up at agreed time. Reasonable prices too!